Members Kit Fields, Sally Todd, Ton Reitvelt, Wanda Vialet and Janie Davis Critique a work. Marie Gaddis (2nd from right) looks on. It was twenty four years ago that the Gaddis Group first opened its doors as an exclusive group of watercolor artists. Originally founded by more than two dozen students, the intent of the group was to find a shared space to create artwork together and share the knowledge that was passed on from their late mentor, and the group’s namesake, John Gaddis. 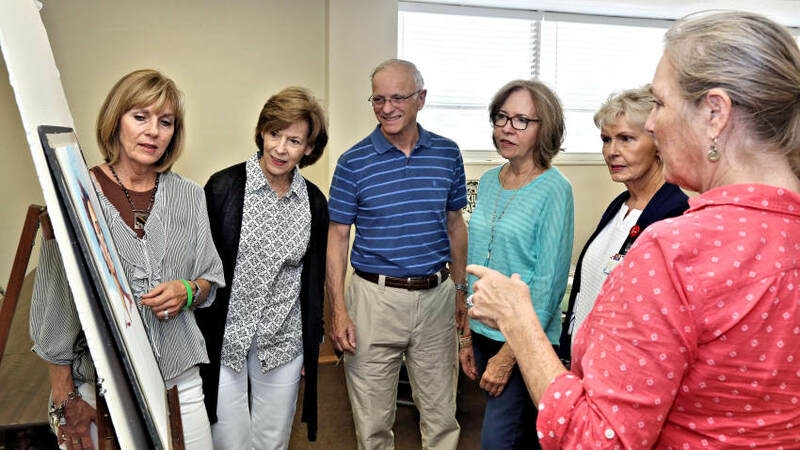 In recent years, the Gaddis Group has been a mainstay on the second floor of Fondren Corner with the members’ artwork adorning the walls on the first level. Most recently, the group decided to make a transition to a new studio within the same building. It may have been a simple move down the hallway, but the change in location represented a shift in focus for the current group of painters. It’s a modification that one of the group’s founders, Ann Barron, strongly advocated for. In the old space with its vast white walls, painters would hang their art and use the location as a gallery space to show off their work to potential buyers. Now, in a tighter and cozier environment, the focus is back on the painting. “It’s not a business,” Barron states simply. “The new space is a working studio.” The goal is to have the group come together for the simple purpose of creating artwork together and learning during that process. Every member has a key to access the studio any time they choose, but the whole group comes together in their space on Tuesdays. Having previously worked and taught in New Orleans, John Gaddis chose Jackson as the location for a new workspace mainly for its ample available parking space. For current day members who struggle with the lack of parking in the Fondren neighborhood, the dripping irony of that sentiment isn’t lost. “Some of us get here at 8:45 in the morning just to get a parking space!” Barron notes with a laugh. Once the group sets up their work, they take off into a day filled with painting and constructive critiquing of one another. “You get blind to your painting after a while and it really helps to have a fresh eye,” Barron explains. During critique sessions, there is lots of laughter, but typically no hurt feelings. “We are truly a family,” Barron says of her colleagues. In fact, many often will stay and have lunch together at the table in the front of the studio before continuing on with their painting and critiques. But seemingly more important than his artwork was his devotion to teaching his craft to others. “He loved his students,” Gaddis goes on to say, “As a matter of fact, I think they contributed to keeping him alive for an extra year.” While Gaddis suffered from lymphoma and was in the process of shutting down his own studio due to his failing health, his dedicated students united to form a studio of their own in order to continue on his work. It was during that final year of his life was when the students first opened the doors to the Gaddis Group in 1992. If you are interested in seeing the work of one of the Gaddis Group artists, the studio, on the second floor of Fondren Corner, is open to both students and visitors. Additionally, should you see any artwork on the first floor of the building that strikes your fancy, you are welcome to call the artist and make an appointment to see additional work on any day of the week.